Independent mediators have been called in with the hope of ending a looming “indefinite” bus strike in Aberdeen. 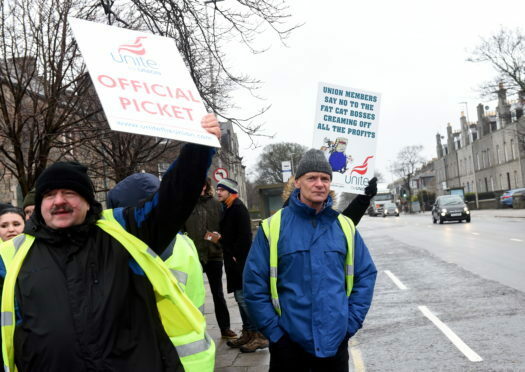 First Aberdeen employees in Unite the Union are expected to down tools on Friday, with no end date set for the industrial action. The transport operator has now asked for a meeting with the Advisory, Conciliation and Arbitration Service (ACAS) to negotiate a compromise between the two sides. Unite says the suggestion of this had previously been rejected, while First said it was felt the move was not necessary at that point. Crunch talks have been held at several points in recent weeks, but all have broken down without an agreement. Union branch convener Graham Gavin said: “We’re hoping to get a meeting with ACAS early in the week. “ACAS has worked in the past and I don’t see any reason why it shouldn’t work now. The union claims that the changes to terms and conditions proposed by First would result in a £5,000 pay cut for drivers. First has said the move is necessary in order to safeguard jobs in the long term.